At 2003 dedication of Jerry's portrait gallery of over 175 paintings of historical figures at Gerstell Academy in Finksburg, Maryland: Governor Robert Ehrlich Jr., Mrs. Rob Smith, Jerry Breen and Lieutenant-Governor Michael Steele. Gerstell Academy's Gallery of Heroes is possibly the largest gallery of portrait paintings by one artist in the world. Jerry Breen is a versatile graphic artist who works in a wide variety of media and genres. His artwork has appeared in all communications media including television, books, magazines, billboards, album covers and web pages. His portraits are owned by major figures in government and business, including former Governors of Maryland, President George W. Bush and former President Bush, and the owners of FUBU Sportswear. His caricatures are prized by celebrities such as singer Tom Jones, baseball legend Rickey Henderson and several former Baltimore Orioles. 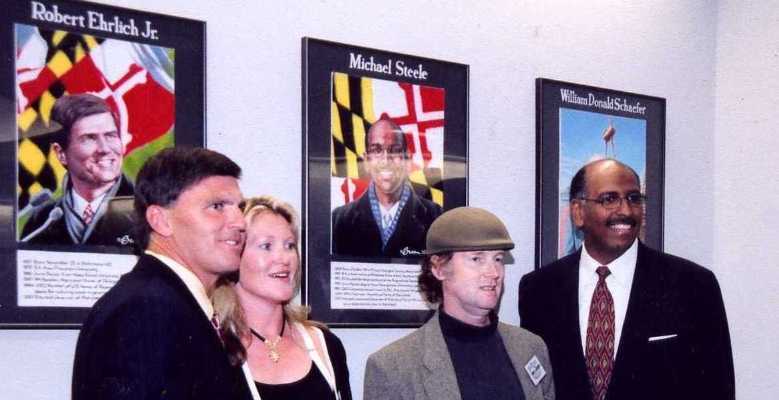 Television shows such as HBO's "The Wire" and NBC's "Today", and publications including National Lampoon, The Baltimore Sun, Baltimore Magazine, The Staten Island Advance and the SoHo Weekly News have featured his art. Breen's work includes portraits, landscapes, advertising art and storyboards, posters, comic strips and editorial cartoons, architectural designs and renderings, logo designs, technical and medical illustrations and caricatures. The largest single collection of Jerry's work is a gallery of over 150 portrait paintings of historical figures at Gerstell Academy in Finksburg, Maryland. Other major collections of Breen's portraits are at The Great Blacks in Wax Museum in Baltimore, and at Manhattan College and St. John's University in New York City. Jerry is now working on his second novel. He has written screenplays and children's books. A native New Yorker of the baby-boomer generation, Jerry has lived in the Baltimore, Maryland area for many years with his wife Alesia and their son Corey.